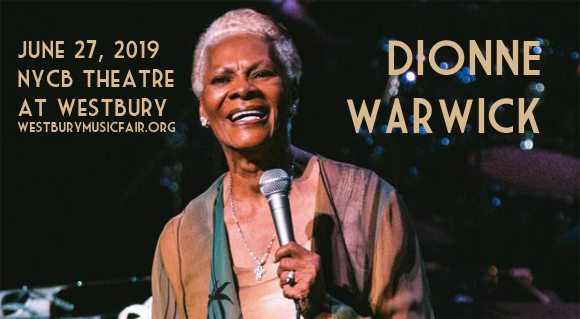 One of the biggest-selling female artists of all time, with one of the most distinctive and powerful voices, the legendary Dionne Warwick comes to NYCB Theatre at Westbury on Thursday 27th June 2019! The iconic, five-time Grammy Award-winning singer will be performing from her eagerly anticipated new album, She's Back, which is her 36th full-length studio recording, and her first since 2014! This year also saw the unparalleled songstress honored with the Grammy Awards’ highest accolade – the Lifetime Achievement Award, which is only fitting for this revered lady of song! American singer, actress, and television show host Dionne Warwick began her music career in the early 1960s as a singer with sought-after backing group The Gospelaires. Warwick's work with the group led her to meet legendary songwriters Burt Bacharach and Hal David, with whom she recorded several hit songs, and she released her debut solo single (written by the pair), "Don't Make Me Over", in 1962. The hits "Anyone Who Had a Heart" (1963) and "Walk On By" (1964) made her an international star, marking the beginning of a long and hugely successful career for Warwick. To date, Warwick ranks among the 41 biggest hit makers of the entire rock era (based on the Billboard Hot 100 Pop Singles Charts) – second only to Aretha Franklin as the most-charted female vocalist of all time, with 56 of her singles making the Billboard Hot 100 between 1962 and 1998, and 80 singles making all Billboard charts combined. Warwick has won five Grammy Awards throughout her career, among many others, and has sold over 75 million singles and 25 million albums worldwide.